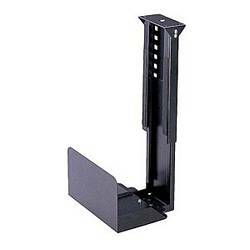 Keep your computer clean and out of the way with our convenient CPU holder under-desk mounting kits. You save floor and desktop space while keeping your media drives within easy reach. Constructed of rust-proof, powder-coated steel, these sturdy brackets adjust to fit virtually any size tower case or can be used to conveniently mount a desktop case on it's side. They are fully padded with anti-scuff, anti-skid foam to protect your computer case and prevent it from sliding out of the bracket.